Meet me -- SHREYA: GET the Basics Of 123 Deal Right!!! Well right now the whole India knows the kind of upheaval that’s on the Political front so fragile now that General Elections are anytime possible. And with the Newspapers offering too much stuff on the same nobody knows what the real matter is ?? ?View points can be understood once you know what this deal is all about the pros and cons and what party says What and Why says so? What’s the ABC of this 123 deal?? The name comes from Section 123 of the US atomic energy act. Section 123 of the United States Atomic Energy Act of 1954, titled "Cooperation With Other Nations", establishes an agreement for cooperation as a prerequisite for nuclear deals between the US and any other nation. Such an agreement is called a 123 Agreement. To date, the U.S. has entered into roughly twenty-five 123 Agreements with various countries. It covers the laws for the "development and the regulation of the uses of nuclear materials and facilities in the United States and substantially refined certain aspects of the law, including increased support for the possibility of a civilian nuclear industry with different countries. Members of Nuclear Non-Proliferation Treaty (NPT) are granted access to civilian nuclear technology from each other as well as nuclear fuel via the Nuclear Suppliers Group in exchange for IAEA-verified compliance of the NPT tenets. India, Israel, and Pakistan, however, have not signed the NPT, arguing that instead of addressing the central objective of universal and comprehensive non-proliferation, the treaty creates a club of "nuclear haves" and a larger group of "nuclear have-nots"
…… by RESTRICTING the legal possession of nuclear weapons to those states that tested them before 1967, who alone are free to possess and multiply their nuclear stockpiles. The treaty never explains on what ethical grounds such a distinction is valid. India insists on a comprehensive action plan for a nuclear-free world within a specific time-frame and has also adopted a voluntary "NO FIRST USE POLICY". In response to a growing Chinese nuclear arsenal, India conducted nuclear weapon tests in 1974. Led by the US, other nations set up an informal group, the Nuclear Suppliers Group (NSG), to control exports of nuclear materials, equipment and technology. As a result, India was relegated to a pariah status within the international nuclear order. In view of continued proliferation by China and Pakistan, and its own huge population, India conducted 5 more nuclear tests in May,at 1998 Pokhran. 1.India can have nuclear cooperation & trade with US and others WITHOUT Compromising its Weapons Program. 2. India need not sign NPT or put its nuclear facilities under full time safeguards. 3. Assured Fuel supplies for its civilian nuclear reactors. 4. It allows India to reprocess and recycle spent fuel. 1. India gets access to more diversified sources of energy. It breaks open a regime that blocked India’s access to high technology after 1974. 2. High tech and dual use of tech in sectors like IT, space, defense, pharmaceuticals. 3. India will get recognition as state with advanced nuclear technology. 4. The deal WONT be offered to Pakistan. 5. It gets to keep its present nuclear weapons. 6. It wont be a relegated to a pariah state. 7. The deal allows India to achieve its 20,000 MW of power by 2020.Also its clean energy savings on the carbon emission wil be big. 1. Rise of India helps US in the post cold war world ; India and the US on the same side. 2. 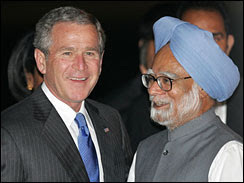 The United States held India’s attitude to Iran to be a test. India responded by voting against Iran not once, but twice, in the International Atomic Energy Agency (IAEA). 3. US firms can partner India in high tech ventures(including sectors of civilian nuclear energy, strategic economic alliance, Defense exercises) which right now are forbidden at present. 1. If India conducts a Nuclear test. 2. The bar on the test would be upheld by the Nuclear Suppliers’ Group. 1.Left thinks its too generous to India. 2. The “Wrong signal” will go to Iran, North Korea, Pakistan and would undermine our friendship with these countries. 3. India should make N weapons on its own uranium without assistance of the Big shots. 4. The BJP ,The CPI(M) and several top nuclear scientists and institutions in India have asked Prime Minister Manmohan Singh to not accept the deal in its December 2006 form as it stipulates conditions that in some areas are more severe than the clauses in either the NPT or the CTBT. 5. Several top Indian nuclear scientists have written an appeal to Indian parliamentarians to ensure that "decisions taken today do not inhibit India's future ability to develop and pursue nuclear technologies for the benefit of the nation". Opposition on how much the HYDE Act is biding or not. US according to its Atomic Energy Act, can’t have nuclear cooperation with any country that hasn’t signed the NPT or submitted itself to safeguards. Hyde Act gives US the chance to enter into a treaty with India without entering into the NPT. India should work with US to contain Iran’s N-program. Now the government claims this Foreign policy is not mandatory and not at all binding and the Deal wont come struck if India ignores it. BUT the critics want further clarification. 1. India was not signatory of the NPT (non proliferation treaty). But now gets all the access due to Hyde Act OF US. It mentions the violation of trust by US. Chinese newspaper refer quoted saying “ US has disregarded international opinion to use India as a TOOL for its global strategic pattern”. They feel is injustice has been done because the US is now afraid of the China’s fast growing economy in ASIA. 2. US is clear that there are no international implications and obligations to do things like how the World desires. 3. The Chinese deal was done in 1985 got cancelled in 1998 and now China had no FUEL while India would have. 4. China did not get the processing rights in its own treaty but INDIA has Got it. 5. China had then allowed bilateral inspections by the US and the Australian inspectors but India did not allow them. 6. China has given Australia the right to check and play role in which of its reactors are civilian and which are not. But INDIA has RESISTED this. 7. Again China has undertaken “De facto” permanent safeguards without permanent supply again India has not done so. 8. Another reason is that most Chinese experts have been considering Japan as a hostile nation and since India wants to enter UN security council with Japan. The recent visit of Chinese PM is very crucial to China. In short China feels INDIA HAS STRUCK THE BEST POSSIBLE DEAL WITH US in NUCLEAR front. And the similar reasons exit for Pakistan’s insecurity too.